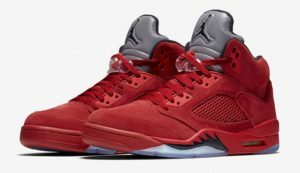 This weekend Jordan Brand is releasing another flight inspired retro 5 dubbed the “Flight Suit”. The Air Jordan line has always taken inspiration from the act of flight, both on and off the court. In 1990 it was WWII fighter planes, whose forms and features – especially the shark-mouth nose art – were echoed by the Air Jordan V’s most distinct design lines. The theme was continued on the classic red-and-black flight suits from the same era. The latest Air Jordan V connects both expressions of flight, delivering a stand-out look that’s loaded with history.